Siân Phillips' Trip to New England: A Welsh Americana Mix Live with Sarah Hotchkiss, Iain MacHarg, and John Mowad. PDF OF TRACK LIST AND ALBUM INFORMATION. Purchase CD or Download card directly from Sarah Hotchkiss or through CD Baby. Press Release about Sian Phillips's New England Tour PDF. 3D View of Sian Phillips and Friends CD. 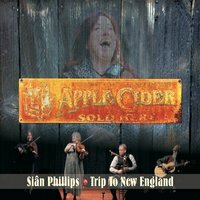 3D View of Sian Phillips - Trip to New England CD. (please add $3 shipping USA only, Download cards $10 includes shipping). Sian Phillips Trip to New England also available online and worldwide. To order please mail check to Woodbury Strings, 12 North Street, Suite #7, Burlington, VT 05401. Please indicate how many and include mailing address! For questions contact Sarah Hotchkiss. Sarah and John created this CD to celebrate their 10th wedding anniversary. It was recorded in Sarah’s mother’s kitchen and the tracks are fresh and genuine. It is an album full of love and appreciation that Sarah and John have for each other and for all their family and friends who have inspired them to create this music and to keep on playing for the love and joy of it all. The tunes represent some of Sarah and John’s favorites that hold special meaning for them from the various genres that they have enjoyed over the years including Welsh, New England, French Canadian, and Old Time styles as well as several of John’s original fiddle tunes that have become favorites. To order this CD send $10 plus $3 shipping to Woodbury Strings, 12 North Street, Suite #7, Burlington, VT 05401. For questions contact Sarah Hotchkiss. "That Had Its Moments" is a fresh and exhilarating CD of fiddle/banjo and fiddle/guitar favorites with a few lyrics thrown in. Makes you feel right at home! John plays his exceptionally beautiful Eusebe Champagne fiddle tuned down a step for a particularly gutsy sound, while Sarah plays sweetly and honestly paying some homage to her New England roots. Each player has a distinctive style that you'll appreciate, and the back up guitar and banjo give just the right touch for one joyous and danceable tune right after the other! If you want to get cheered up, this CD will do it! “Live Performances of the judges at the 42nd Annual Northeast Regional Old Time Fiddler’s Contest: Barre, VT 2008" is a two disc CD just loaded with tunes from the following artists and their bands: Bill Cameron, Nicole Engstrom, Sarah Hotchkiss, Ron West, Tom Wilkinson, and Don Woodcock. These performances took place in between divisions during the fiddle contest and were each at least 15 minutes in length with a wide variety of tunes and styles represented. That's two CD’s for the price of one: $15 plus $2.50 S/H! It's worth the price of the CD alone for Don Woodcock’s version of Orange Blossom Special . Another treasure on the CD is nine traditional New England tunes played by Vermont’s own fiddling legend, Ron West. John and Sarah play several fiddle guitar duos including John's original tune, "Kerry Sunset Waltz" which many fiddlers have started learning and playing around the region. Nicole Engstrom, Tom Wilkinson, and Bill Cameron all give stellar performances as well! This CD was created as a fundraiser for the New England Fiddlers Association. To find out more about NEFA and this CD, download this PDF FILE which will also give you instructions on how to purchase the CD. This CD, “SPROUT” was made by one of our own youth fiddlers, Kate Dwyer Frattalone in our studio, using our finest recording equipment. It is a beautiful, professional quality recording of fiddle tunes and songs that Kate recorded mostly during her 15th year of age. This CD is sure to inspire the young musicians in your household to work toward their own such creations! Kate has a distinctive fiddling style and a beautiful voice that is captured just at that delicate point between young teen and young woman. Her Motherless Child will make you weep, and her interpretation and delivery of an old classic, Barbara Allen is an achievement by any standard! Her fiddling is fresh and exhilarating, sure to get you up and dancing. Another special treat on the album is one of her original songs, "Be With You," recorded with her band, "The Dear" (Rachael Rice, guitar/harmonica/vocals, and Margaret Stocksdale, mandolin/vocals) with whom she got much of her earliest professional performing experience. Other tracks on the album are old time favorites such as, Oh Susanna, Shady Grove, Old Joe Clark, and Sally Ann. There are two other great fiddle tunes from the south that are less well known in these parts: Gunboat and Sally in the Lane. Add to this a set of jigs (Old Woman Tossed Up in a Blanket, Stan Chapman’s Jig by Jerry Holland, and Juniper Jig) and you have a wonderful mix of just great music freshly interpreted by a young artist with a lot of talent and genuine musicality. This album was brilliantly recorded, mixed, and mastered by John Mowad who plays some very fine backup on guitar and fiddle. Sarah, who was Kate's fiddle teacher from the time she was 5 years old, also had the great privilege of accompanying Kate on banjo, fiddle, and viola on a few of the tracks. Some of the tracks include Jen Wells or David Gaillard on upright bass to help give it that old time string band sound! For Kate, SPROUT is in some ways a primer, her springboard as an emerging artist, as well as a tip of her hat to her roots before she branches out to do many new things. It captures that very special moment in time in the life of a young musician, and at the same time is just great listening! !